Letscher creates poetic, often playful collages out of found objects, such as old letters, newspaper clippings, books, recipes, and album covers, all cut and composed into fascinating patterns and textures. 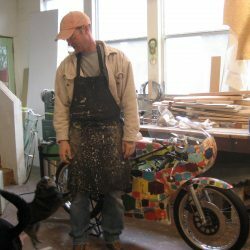 Letscher has an eye for harmony of color and the familiarity of his materials adds to his work’s broad appeal. His constructions are amplified by the engagement of viewers’ memories and emotions with the familiar materials he uses. A skilled colorist and abstractionist, Letscher’s growing international reputation has resulted in solo shows in England, France, Germany, Poland, and Spain. In 2009, his monograph Collage was published by the University of Texas Press. He has been reviewed by Art in America, Harpers, and numerous Texas publications. His art resides in the collections of the Austin Museum of Art, the Houston Museum of Fine Arts, and numerous corporations. Washington, DC. Travels to Hanoi, Ho Chi Minh City, Shanghai, Beijing, Singapore and Jakarta.